Life-Flo MSM & Glucosamine contains the maximum concentration of MSM and Glucosamine available in a cream. Research shows that MSM helps reduce inflammation and scarring and is an excellent skin softener. Glucosamine provides nutrients for cartilage rehabilitation. Physician developed and scientifically formulated. MSM and Glucosamine helps provide support for connective tissue and cartilage specifically in joints. Research suggests that MSM is a basic element essential to many structures and functions of the human body. 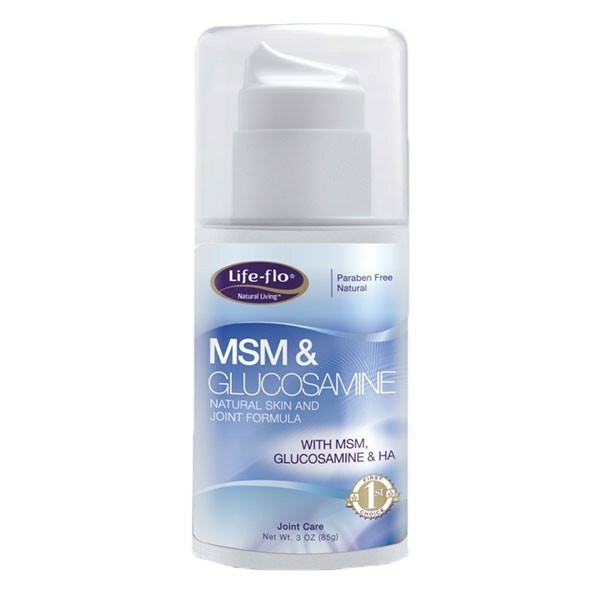 Glucosamine is one of the "building blocks" of cartilage and provides nutrients for cartilage rehabilitation and a .
Life-Flo MSM & Glucosamine contains the maximum concentration of MSM and Glucosamine available in a cream. Research shows that MSM helps promote a healthy inflammation response, may minimize scarring, and is an excellent skin softener. Glucosamine provides nutrients for cartilage rehabilitation. Physician developed and scientifically formulated. MSM (Methylsulfonylmethane) is a naturally occurring dietary sulfur compound found in all living things. Sulfur is present in every cell in the human body, and is the eighth-most common compound in the body. It makes up about 1% of a person's body weight, and is critical to the normal function and structure of the human body. MSM is a raw material needed for the natural production of protein, and connective tissue. This natural compound helps protect us against toxicity, and harmful oxidative stress. Sulfur has a long history of healing, but its benefits are often overlooked. Glucosamine Sulfate is a natural substance that is derived primarily from shellfish. Glucosamine is not only beneficial for cartilage, tendons, and joints, it also helps support the synovial fluid (between the joints), which serves to lubricate the joints. This product is available in a 3 oz. pre-measured pump, and concealed in an airtight, support container that helps to protect the ingredients from oxidation and ensures the potency of the natural ingredients. Ingredients: Purified Water, Aloe Barbadensis (Aloe Vera Gel), Glycerin, Butyrospermum Parkii (Shea Butter), Stearic Acid, Helianthus Annuus (Sunflower) Seed Oil, Glyceryl Stearate, Methylsulfonylmethane (MSM), Caprylic/Capric Triglyceride, Lecithin, Olea Europea (Olive) Fruit Extract, Uncaria Tomentosa (Cat’s Claw) Extract, Sodium Hyaluronate, Phenoxyethanol and Caprylyl Glycol, Allantoin, Tocopherol (Vitamin E), Elaeis Guineensis (Palm) Oil (and) Tocotrienols (and) Tocopherol, Dipalmitoyl Hydroxyproline, Sorbic Acid, Sodium Bicarbonate, Glucosamine HCL, Flavanoid (Sangre de Grado), Oenothera Biennis (Evening Primrose) Oil, and Vitis Vinifera (Grape) Seed Extract. Suggested Use: Apply to skin, morning and night, as needed. Warning: For external use only. If irritation, redness or discomfort occurs, discontinue use and consult a licensed healthcare practitioner. Use only as suggested. Avoid contact with eyes. Do not apply directly underneath the eye or on top of the eyelid. Keep out of reach of children. Manufactured by Seychelles Organics Inc for Life-Flo Health Care Products. Made in the USA. No animals were used to test this product.